Using a restored Vulcan gas oven and traditional copper jam pots, Fairywood Thicket Farm, located in Fairburn, GA, uses the fruits, herbs and flowers harvested from their land, from their neighbors, and from local farmers to create a charming line homemade jams, jellies, and chutneys. 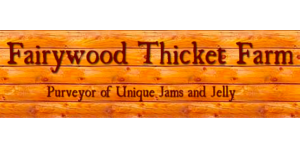 The story behind Fairywood Thicket's delicious line of jams and jellies starts with an old elderberry tree and an elementary school science project. It is said that when the fairies come through on a mid-summer night, they ride the elderberry branches like horses, causing them to tip over and the fruits to ripen. Elderberries grow in thickets, so the name "Fairywood Thicket" fits well. A portion of their sales support their non-profit Therapeutic Riding Center for Disabled Veterans, active Military, first responders and their families. What led you to the sweet world of jams and jellies? Was this a life-long passion, or a new hobby-turned-career? This whole adventure was an accident. An unintentional blessing. We set out to clear out horse pasture and discovered what we were trying to cut down was Elderberry. The folks explained what it was, and said they would clear our pasture for free if we waited for the elderberry to ripen. Our kids needed to do a sustainable science project. So... we made Elderberry jelly. The kids won their science fair. We gave some away, and it got to a small local farmers market, and people loved it. So, we kept making it! Then we made pear jam from our family trees, and then pepper jelly, and one thing led to another and it more fed into the 72 plus flavors and far-reaching business we are today. We have and will always be a family adventure, steering clear of copackers, artificial ingredients and food colorings. Our goal is to support local, growing and sourcing local as much as possible. The coolest thing is that each time we out grow our shell, so to speak, whatever is needed is always waiting for us from space, new ideas equipment or an incredible opportunity like working with Peach Dish. What's your favorite flavor? Or, more importantly, which flavor is the optimum choice to complement peanut butter in say, a sandwich? My favorite flavor is our Strawberry Lavender, an amazing medieval historic recipe. 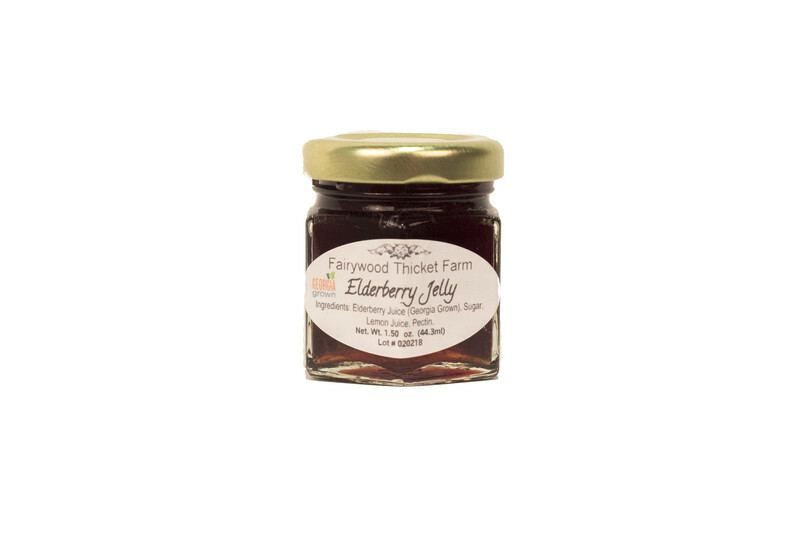 This amazing jam also won the Jam Division of the Flavors of Georgia in 2015. Then followed by out Peach Pecan being a runner up in 2016. Strawberry Lavender is one of our most popular and versitile jam from PB&J, to cheese cake, ice cream, even a salad dressing. It is also a wonderful glaze with a bit of pepper flakes over pork chops. It's even a base for Strawberry Daquris! I hear you have spicy selection known as "The Inferno"... How many tongues have you caught on fire with this jelly?! Our inferno jam is quite amazing. It is a delicious powerful jam. We look like a hazmat team with paint respirators, goggles, full length gloves and plastic aprons.... to a warning call to the neighbors, while cooking this concoction. Yes, I have scorched a few tongues, drawn a few tears and created a small cult following. It is pure molton magic. 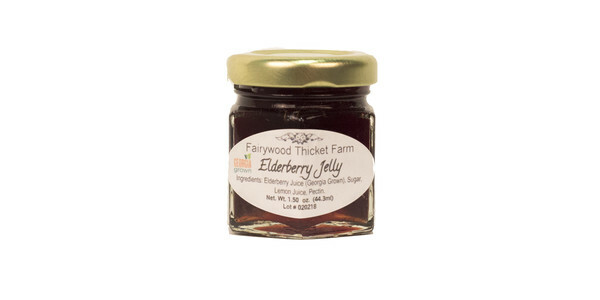 Summery sweet with a deep purple hue, Fairywood Thicket's elderberry jelly is "the one that started it all". 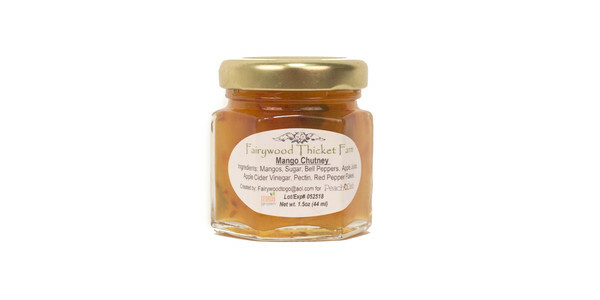 Exceptional as a spread on toast with a soft cheese or nut butter, but also great in many other preparations like vinaigrattes, tarts, and cocktails. Using a restored Vulcan gas oven and traditional copper jam pots, Fairywood Thicket Farm, located in Fairburn, GA, uses the fruits, herbs and flowers harvested from their land, from their neighbors, and from local farmers to create a charming line homemade jams, jellies, and chutneys. Sweet and hot, this is a combo of mango and red peppers with a tiny dash of Red Savina, one of the hottest peppers in the world! Spread it onto a sandwich or fold into cold creamy salads for a unique twist, or use it to garnish a classic Country Captain recipe. Using a restored Vulcan gas oven and traditional copper jam pots, Fairywood Thicket Farm, located in Fairburn, GA, uses the fruits, herbs and flowers harvested from their land, from their neighbors, and from local farmers to create a charming line homemade jams, jellies, and chutneys.